Our Victoriana Freestanding Tub Filler - a fabulous looking vintage British telephone style faucets that transcends the ages, it is suitable for both vintage and transitional spaces. Features a longer than average elephant spout, which gives this tub filler excellent reach over the side of a tub. Supplied in our specialty polished brass "living finish," with our rigid freestanding supply lines. The freestanding supply lines are on 7" centers, feature internal 1/2" flex lines, and include all the hardware necessary to install a complete, rigid floorstanding faucet from the floor up. 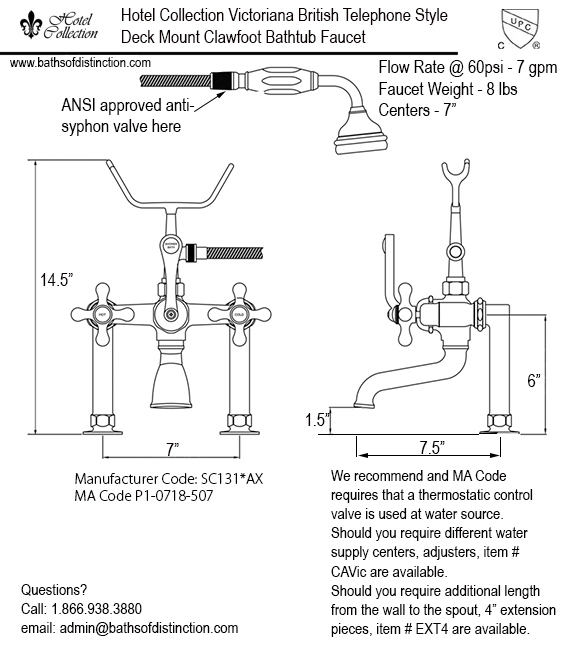 These supply lines allow the faucet to be mounted completely freestanding with no support from a tub or a wall, and is typically used with tubs that are not suitable for a deck mounted filler, or when the appearance of a freestanding faucet is preferred. The un-lacquered polished brass is a living finish. To maintain it's soft color finish, wipe after each use with a soft cloth. It will still darken, but very slowly. To maintain its shine, a polish like Mothers will always bring it up sparkling again. If left untouched, it will form beautiful patina over the years. The 'Victoriana' is a fabulous looking vintage English telephone style faucets that transcends the ages. It works with both vintage and transitional spaces and with the longer length than usual and extremely elegant elephant spout, it is great for reaching over a tub edge. The un-lacquered polished brass is a living finish. To maintain it's soft color finish, wipe after each use with a soft cloth. It will still darken, but very slowly. To maintain its' shine, a polish like Mothers will always bring it up sparkling again. If left untouched, it will form beautiful patina over the years.